Get OUTSIDE, EXPLORE, and DISCOVER NATURE and ANIMALS with EcoAdventures! Looking for something unique, exciting AND educational to keep your child busy when school's out? 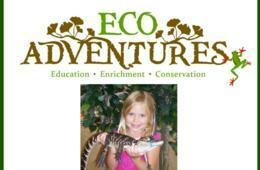 EcoAdventures is here with exciting themes to entertain them! Within their 3800 square foot interior space, campers can experience the sounds and sights of a simulated rainforest and mysterious underwater cave discovery room. And, just outside the backdoor, lies the neighboring Severn Run Wildlife Area -- 1700 acres of pristine wilderness ready to be explored by young conservationists. This isn’t any ordinary camp! Go ahead …. Experience the Extraordinary! The Deal: $64 for One Day of EcoAdventures School's Out Camp ($80 Value - 20% Off). Before Care from 8-9 a.m. and After Care from 4-5 p.m. are available for $9/day for either Before OR After Care or $13/day for BOTH. HURRY! Limited number of spots available at these very special rates! For ages 5-11 and 12-14 Counselors in training (CITS). Valid for NEW campers only (those who haven't purchased an EcoAdventures camp in the past 12 months). EcoAdventures is a peanut-free facility and they only provide snack alternatives for peanut/nut allergies. Please let them know of any allergies in advance. Children with multiple allergies other than nuts must bring their own snacks from home. Must register with EcoAdventures at time of purchase. Based on availability. To Redeem and Register for Camp: Registration is required and space is limited. You must register with EcoAdventures by emailing the following information to [email protected]. Once this information is received and you have been entered into EcoAdventures' system, you will get an email confirmation that finalizes your registration. Important: Registration is not complete nor can EcoAdventures guarantee a spot if you do not register at least three days prior to the start of camp. Please note, you are NOT officially registered for camp until you follow these instructions and receive a confirmation email from EcoAdventures. Questions? Need More Information? Please contact EcoAdventures at 410-987-1300 or email [email protected]. Valid only for the camp sessions listed above. Multiple vouchers may be purchased and redeemed for multiple children or multiple camp days. Cannot be combined with any other special offers, promotions or discounts. Not valid on prior camp enrollments. Refunds issued within one day of purchase only. Vendor is responsible for the quality of the products or services provided at redemption.